Decor- The décor in a room may seem like a minor detail, but can go a long way in impressing your clients. A few pieces of art strategically placed throughout your reception area can be thought provoking and welcoming to new clients and customers. If you notice a new client taking time to view a piece of work hanging in the reception area, you now have an icebreaker to begin a conversation with your new client. Desk- The reception desk is the main focus in most reception areas. Choose a desk that is sturdy and fits comfortably within your space. Choose a style and color that can pull a room together and can be easily matched with décor and seating. A desk with plenty of room and shelves can help your reception area look organized and professional. Seating- Choose seating that is comfortable and classy for your reception area. Pick a style of seating, whether it is chairs or couches, and stick to it. If you want a mix of both, be sure to have the colors and styles matching. Having seating that doesn’t match can make your reception area look sloppy and thrown together. 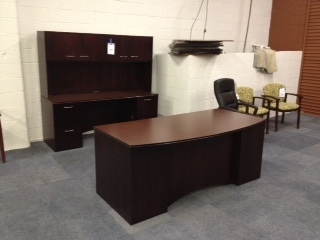 At Mark Downs Office Furniture, we specialize in furniture for every reception area. Choose from our wide selection of desks, seating, and artwork to furnish your new reception area. This entry was posted on Thursday, July 3rd, 2014 at 1:44 pm. Both comments and pings are currently closed.